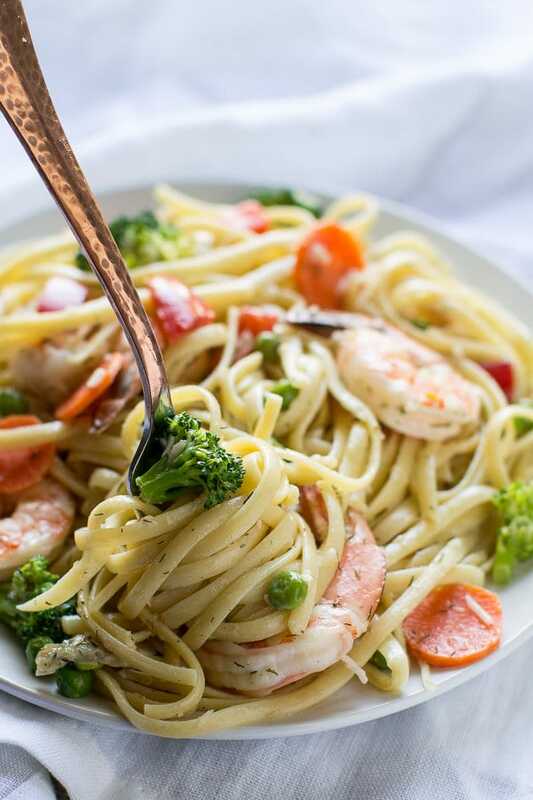 This delicious Shrimp Pasta Primavera is IDEAL for busy weeknights! It’s ready in 30 minutes and uses just one pot for everything making cleanup a breeze. It seems like a lifetime ago that I worked in the Accounting department of a restaurant supply company in Wisconsin. I didn’t have a food blog in those days, but the writing was on the wall. I was already obsessed with food. I collected and distributed recipes like they were currency. I worked in a small department with awesome coworkers. One coworker in particular always had something fun for lunch. (She also ironed her jeans and sweaters. She was the total package). This Shrimp Pasta Primavera was one of her recipes. She got it from the back of a McCormick Recipe Inspirations package (they sell small amounts of different spices in a package, along with a recipe, and you supply the rest of the ingredients). I have adapted it further over the years and it tastes even better than I remember. It takes me back just the same! 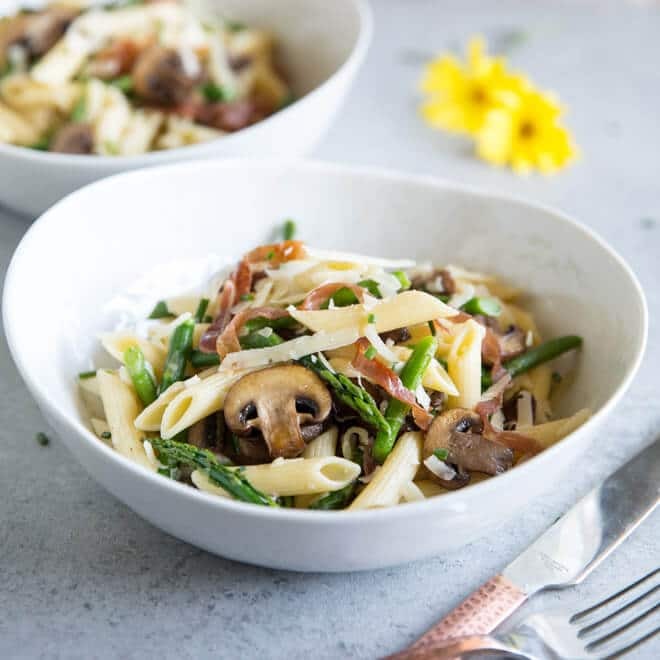 The reason YOU might be interested in Shrimp Pasta Primavera is because you can make it in one pot, on your stove top, in 30 minutes or less. Hello, easy-weeknight-dinner-solution! It’s packed with veggies, chewy pasta, a light cream sauce and plenty of shrimp. If you love shrimp, you are going to love this recipe! 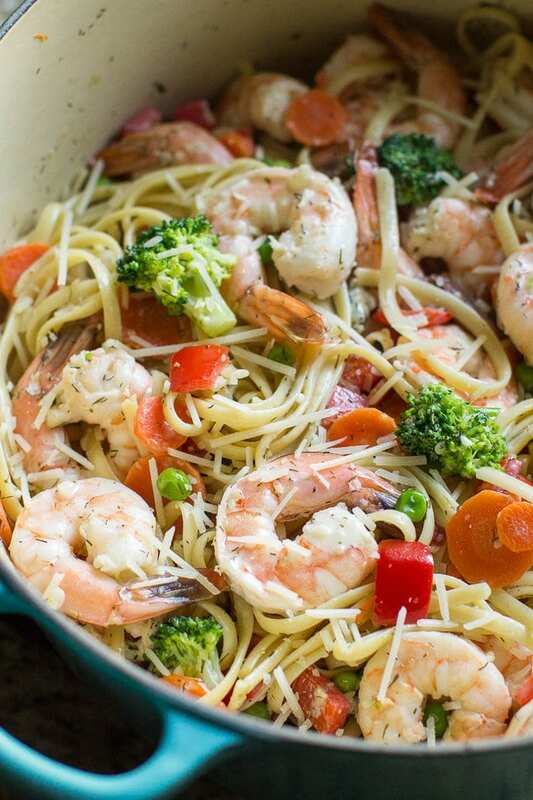 Save this One Pot Shrimp Pasta Primavera to your “Easy Dinners” Pinterest board! This delicious Shrimp Pasta Primavera is IDEAL for busy weeknights! It's ready in 30 minutes and uses just one pot for everything making cleanup a breeze. In a large pot or Dutch oven, bring 3 quarts water to a boil. Add pasta. Cook until al dente, about 7 to 10 minutes, adding the shrimp, broccoli, peas, bell pepper, and carrots to the pot during the last 4 minutes of cooking time. Drain well. In the same pot, melt butter until foaming. Stir in garlic until fragrant, about 30 seconds. Add dill, onions, thyme, cream, broth, parmesan, 1/2 teaspoon salt, and 1/2 teaspoon pepper. Bring to boil, whisking constantly, then reduce heat to low and simmer 5 minutes. 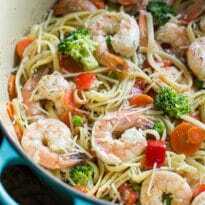 Add pasta, shrimp, and vegetables back to the pot and toss to combine. Serve immediately, passing more parmesan at the table for garnish. Adapted from McCormick Recipe Inspirations. Hi Meggan; thank you for this post; it seems ideal to have for a week supper and to take the leftovers (if any left) to office the next day ! And, yes, your photos are great !